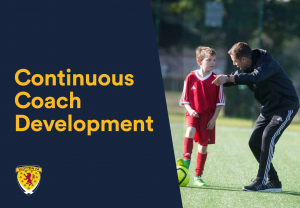 Continuous Coach Development (CCD) will enable all coaches at Level 1 and Level 2 of the Coach Education Pathway to ensure the validity of their coach education certificate award is maintained. Award = any Scottish FA Coach Education Certificate/Licence/Course at Level 1 or Level 2 on the Coach Education Pathway. The link to the presentation below will provide all coaches with the necessary information with regards to this topic. When available, the relevant Scottish FA courses, Events or Coach Education Workshops which count towards CCD accreditation can normally be viewed via your SFA Live site (under the “Book a Course” tab, from there you can perform a course search). Also as part of the ERCL Focus Club Bespoke Football Coach Education Courses we are looking to run events at certain times of the year when possible to assist with Giffnock SC Coaches maintaining their ongoing validity of their Coach Education awards where applicable. These dates will be communicated out separately when they become available.